As a boy, each autumn we'd take our winter woollies from the wardrobe, to find them covered with holes. The culprit was the clothes moth! We don't see them so often these days, as they dislike fabrics containing man made fibres. 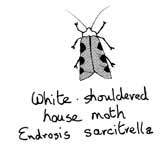 This year, there've been lots of white shouldered house moths in my house. 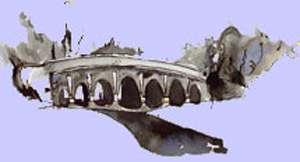 Its wings are bronze coloured, with dark brown splodges symmetrically placed. Outside houses, they usually live in the nests of birds, squirrels, and mice, eating vegetable detritus. There are over 3000 species of moth living in Britain. Most are dull coloured and fly at night: but not all! The Wood Tiger has its front pair of wings cream, with dark brown splodges, and the rear wings orange and black. Five British moths have a name containing the word 'tiger'. The old de Havilland factory at Hatfield once built a biplane trainer plane - called the 'Tiger Moth'. Geoffrey de Havilland was an amateur entomologist, and named several of his planes after favourite moths. One of my favourite moths is the back and scarlet Cinnabar Moth. Its caterpillars eat the leaves of the poisonous ragwort weed. They in turn become poisonous. A bird eats the orange and black caterpillar, or the adult moth - and remembers feeling ill - so it never eats another! A species common all over southern Britain is the peppered moth. Any batch of their eggs will contain individuals who grow into dark brown moths, or white, with scatterred grey spots. Victorian scientists noted the brown variety was commonest in industrial areas, where most surfaces were brown, and the white variety was more visible to foraging birds. They also noted that in rural areas, it was the white variety that was more common ~ and this was an example of evolution in action. People ask - what is the difference between butterflies and moths? The French, German and Spanish words for moth are papillon de nuit, Nachtfalter and mariposa nocturna. This hints at a popular misunderstanding, moths do not all fly only at night! Butterflies more often perch with their wings vertically above their bodies - particularly in the morning, when they want the sun to warm their blood. But so do many moths! Most moths have feathery antennae, so they can home in on distant food plants. Most moths have hairy bodies, to keep them warm at night - but so does the Apollo Butterfly, - a white butterfly with red discs with black outlines on its wings - which frequents alpine pastures in Italy and Austria. The only true difference between butterflies and moths is that moths have a small hook linking their front and back wings- so they beat together. Some moths are a nuisance! There are moths which specialize in eating nothing save crops we grow: there are 25 species of Raspberry Moth, several species of apple and pear moth . . . 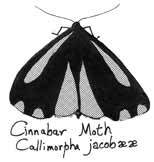 However, many moths, in their search for energy food i.e. nectar, visit flowers, and in the process transfer pollen from one flower to another - helping fertilize them. Moths provide food for birds and small mammals. Moths are interesting in their own right - it is a pity people do not realise what a wonderful variety of moth there are to be seen. If you really want to see lots of moths, lay a white sheet on the ground in a leafy forest. Put stones down, to stop it blowing away, and train some bright lights on the sheet. Somewhere on the sheet, place a saucer, with water containing a little honey. If it is warm, after a while you'll find lots of moth - but beware - many moth do not like-the smell of humankind!